John J. Rowe was born in Canada in 1854 and moved to Chicago around 1869. He married Mary Ann Morehead in 1883. By 1890, Mr. Rowe was a horseshoer located at 54 Goethe Street on Chicago's North Side, now 239 W. Goethe Street. By 1910 the couple had relocated to Cicero, Illinois where John worked as a race horse trainer. They died within two months of each other in 1913 and are buried at Mt. Carmel Cemetery in Hillside, Illinois. For further details, contact the Chicago Genealogical Society. 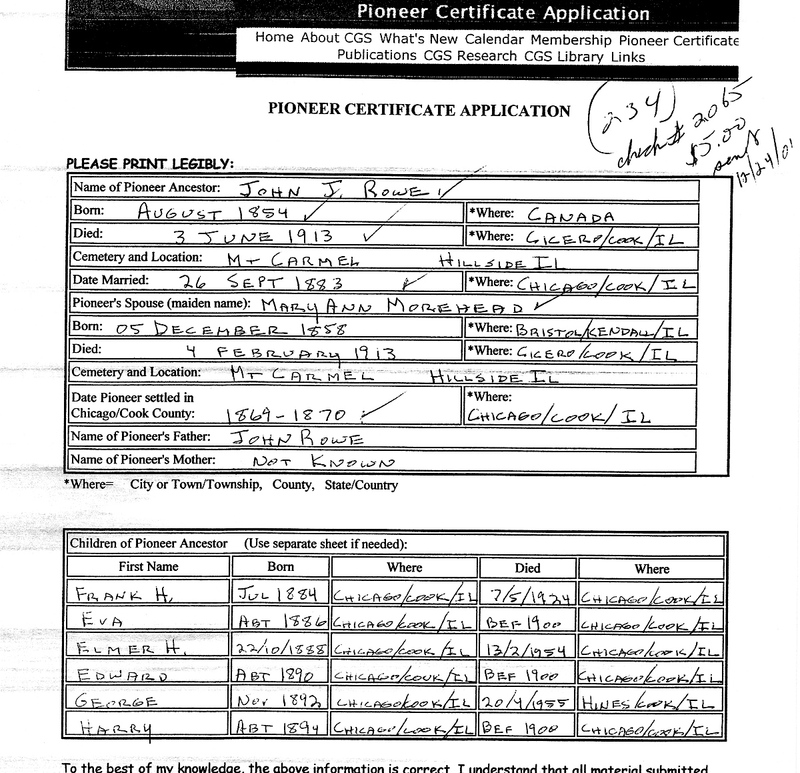 John J. Rowe is Pioneer Ancestor number 234. The pioneer's mother and siblings from 1880 census. Mother - Catharine born 1825 Ireland died after 1880 Chicago Sister - Catharine born 1853 Canada died 16/5/1882 Chicago Twin - Rosa born 1865 Canada ? ? Twin - Theresa born 1865 Canada ? ? Pioneer John J. Rowe and his sister Catharine married sister and brother of Morehead family. The Moreheads arrived in US at least by 1855 as their first child was born in Patterson NJ. They first appear in Illinois in the 1860 census - in Bristol. 1870 census in Somonauk 1880 Chicago. I have spent quite a bit of time looking for the twin sisters but have found nothing except their listing in the 1880 census.